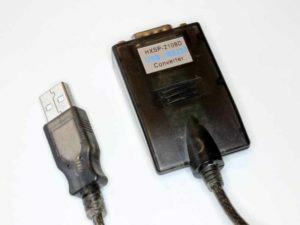 I purchased a USB-RS232 adapter which claimed to use an FTDI chipset. Above is a pic of the device, branded Hexin model HXSP-2108D. The device delivered pretends to be FTDI to the extent it ships with a FTDI driver disk, uses FTDI’s VID and PID to identify to USB, and works to some extent with separately sourced FTDI drivers, but it does not use FTDI chips. Attempts to read the chip with FTPROG return an empty EEPROM that cannot be programmed… in fact it causes errors in FTPROG. eBay effectively supports these sellers of counterfeit goods as they require return of the goods to the seller for possible refund, and in this case that would cost about the same as was paid for the goods. The seller insisted that they would test it and return it or a replacement, carefully avoiding the question of whether it used a genuine FTDI chipset, further reason to not return it as it would just cost good money to get the same counterfeit product back..
eBay harbours counterfeiters, and whilst I have bought plenty of FTDI based devices that appeared genuine (eg using FTPROG), this Hexin product is an incomplete knock off.